Just say it is a storage shed. Watch out for regulations on shed sizes, here the max is 100sf or 10×10 anything bigger and you have to get a permit for having it on your property. That Permits the government to tax you for having it. What I would do, is build a small log cabin. Cut the trees right there on the property Pine is nice for the logs, Poplar for the frameing and sheeting. Have the logs sided and split down the middle to get 2 logs from each tree. Use smaller whole logs for the trusses. Mill the poplar into lumber for flooring, roofing, door and window framing. Easy and cheap 2 year build. You are real close to losing this year if you don’t get the trees on the ground before the sap starts to rise. with the trees down you will limb and cut to general length and stack and sticker them. long about mid June you want to strip the bark off the logs and have the mill pick them up cut them for you. When the mill delivers your logs and lumber you will need to restack and sticker it. In between these tasks you will build your foundation. I prefer sandstone for my foundations, large pieces, easy to shape and flatten. Normally you would be at the end a year one now, if you had dropped the trees in December at their driest state. If you grab some friend and get busy now, you can still save year one by dropping and limbing all your logs by the end of February. Year 2 starts about the first of March. Start by routing a 1X1 inch groove from end to end on both sides of all the wall logs. Of course measuring from the inside flat edge of the log, build a little router jig to center the grooves. You can not start building your cabin. Build a base plate on the foundation just like any other, sand stone works great for drilling anchors and through rebar stakes for stability. Caulk a 1X1 into the groove and all over the bottom of your first run to seal it to base plate, You can if desire drill and countersink screws through that first run but I never bothered. Next is to caulk the groove, insert the 1X2 spline and caulk the groove of your next run. Repeat…Repeat…you get the idea, until you have a 10-12 ft high log box in the woods. Your next step would be to cut out the door and windows in the walls. You will frame the openings to fit your doors and such. Frame in some floor joists and panel over them with you Poplar lumber. Measure out and build your roof trusses out of those smaller diameter logs that were not D cut at the mill. Sheath the roof and install the roof of your choice, shingle/metal. Build up the ends of you open walls not that you have support and know the angles. 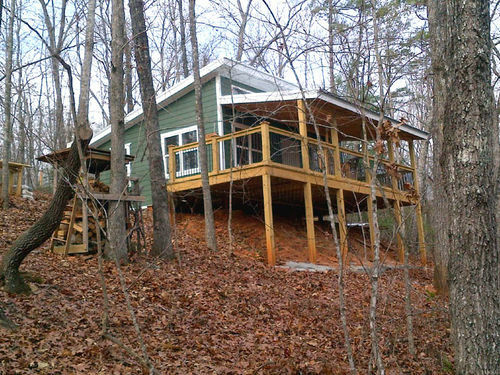 My man….You just built yourself a cabin in the woods. You decide on the size. A couple details to decide, wall thickness, I always like 8” so the logs had to be 18 -19 inches. If desired, use 9-10 inch logs and flatten on each side, this will give you the round logs inside and out. You would need almost twice the logs but they wont be as big. Before you haul off all those extra sand stone boulder you collected, don’t forget your fireplace and chimney! Beg, borrow or buy a bunch of draw knives. You setup a big old BBQ onsite and invite all your friends, that makes short work of debarking all those logs. Inside finishing is your choice, build in a good loft sleeping area and throw up a wall or 2 for privacy. Leave it all wide open and build in some bunk beds, add a little kitchenette area with a stove table and chairs. We had to move a few years ago and all my disc files disappeared. so I have no pictures of my builds of anything form turned pens to full sized furniture, to Homes. If ya wanna tour KY, it would take about 2 days, but I could show you a 28 year old hunting cabin way out in the woods about 5 miles from the road. (4wd accessible/ no prob. ) That one is 20X20 with a flat shed roof. Has kitchen area and 6 bunks beds built on the walls. matresses and supplies are trucked in in Sept and out in Jan. #2 is a two bedroom with sleeping loft. Small kitchen includes running water and propane stove. 21X 31 Summer home on the lake bank for the family/hunting lodge in the fall for the Bros. Dads, and Pa’s. 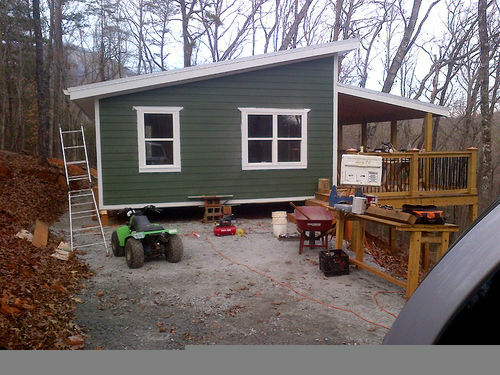 #3 comes in at 36X 48ft Two bed two bath home with loft office. 24’ Vaulted in the open living room /dining rooms. 18’ Sand stone fireplace it the living room. This one is a family home on 20 acres that border mammoth cave national park. All 3 are my disgn and builds, but had the owners and familys and friends to handle 99% of the physical labor for them. My Pay….I can go there and hunt, fish, vacation anytime I want at any of the three plus one more they took me and showed off when completed. I din’t know they built it and they didn’t need me for #4. That sounds good but WAY more work than I hav time for or want to do. I think a 14×18 would b about the best size for me. I don’t want it to b to comfy to make staying in it lik home but also not so small that I get cramped just sleeping there. It’ll likely hav a bigger porch or deck Also where I’m at I’m so far out of the way the inspectors only get involved if u hav a water ran to a place cause then u hav to hav a septic system even if it’s not a full time residence. Have you thought about an A-frame? They are easy to construct and depending on the design, can sleep the kids in the loft and you and the missus on the first floor. The roofing is “built in” and they stand up to some significant storms. since you’re not considering indoor plumbing it’s that much easier. And the loft can double as a shooting blind during hunting season. 14X18 is small, puts you into a shed roof design for easier build and lower cost. Major cost of log cabin is the sawmill bill. You can build your size log cabin for close to half what a prebuilt shed would cost, and building your own shed will cost about the same as buying, just a little better material and assembly than prefab. Really easy to do and have a few lifetimes of use. Have you considered a camper? You can get one pretty reasonable used. I’m assuming you would have an ability to get to the site to do it. 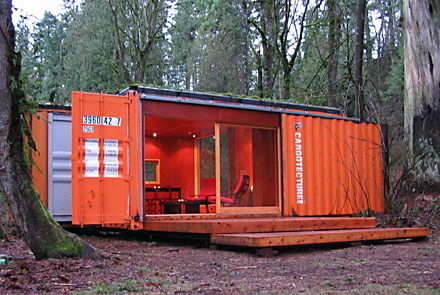 Insane as it may sound how about one or two storage containers? When I was a kid, my grandparents had a “screen house” on their property, back in the woods. It was basically a framed structure on a rock patio that was screened in and had bunk beds. No electric, no running water, just us and nature. I don’t recall the actual floor space, but it was about 15×15, maybe slightly larger. My brother, and I loved staying the weekend there with my dad, and we have good memories. . of course for running water/bathroom/etc we had my grandparent’s house to go to, but there are workable solutions. I guess my point is, don’t limit yourself to a structure with 4 solid walls, think about alternatives like a screened in gazebo, a yurt, perhaps an RV that’s parked there, or just find a good space you can use for a campsite. Also I hav considered a camper. They r not very wide tho. Also they run about $1500 for anything decent enough to hunt out of. For that proce I think I’d be better off putting that money towards material and just do it myself. I hav thought about semi containers however I’d need two. There’s a lot to lik about them such as bug/rot resistant and sturdy. What I don’t lik is that I know very very little about welding and metal work. To use them I think I’d need to do a lot of customization which I’m not comfortable with. Picture that as logs instead of green siding! Really not as hard as it sounds and dirt cheap in comparison.